In Europe at least, single phase power is nominally 230V, having changed from the 240V system in January 2003. The applicable harmonised standard is EN 50160:2000. Power standards in the UK are defined by OFGEM the electricity regulator. However, if you read the fine print you will discover that the 240V system was ± 6% while the 230V system is ±10% for 95% of the time ( - 15% allowed at other times). In other words, we now have a lower quality of supply than we had before. We also tend to assume that being an industrialised country our power generation and grid is delivering what we as consumers would call “quality” power. However a brief look at OFGEM’s annual report shows that, not only is the power supply network filled with problems, but an ever more demanding customer base and intense price competition are actually making the problem worse. So what does OFGEM regard as unacceptable power quality? When is a power cut a Power Cut? Of course when problems do occur you can claim compensation from your supplier, but do you realise how little this compensation is? Private Consumers can claim £100 if a power cut lasts more than 18 hours, or £50 for 4 or more cuts each longer than 3 hours in a 12 month period. Furthermore the supplier can claim exemption for “extreme weather”, even from the 18 hour rule, by demonstrating to OFGEM that “everything reasonable was done.” Although some large commercial contracts negotiated directly with the supplier call for other forms of compensation, if a company doesn’t have a specific contract, the above rules are applied. In over 20 years of Power Quality consulting and manufacturing, Advance has never known of a successful claim against the supplier on “unacceptable power quality”. Therefore, the clear message is “Protect Your Own”. Over the years this question has led Advance to define every different power problem. A voltage variation from the ideal sine wave caused by harmonics of the prime frequency. (150Hz superimposed on 50Hz is third harmonic - illustration from rail site with THD 20%) EN 50160 quotes a Total Harmonic Distortion (THD) of less than 8%. Most Harmonics are internally generated rather than supply borne. 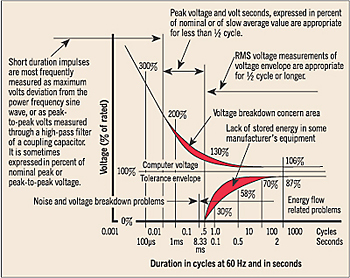 Common mode Noise / Radio Frequency Interference (RFI). As normal mode noise, but where the return or source path is the earth conductor. These definitions are further confused by the fact that they normally occur in groups, often with one disturbance cascading several others. In addition, natural impedances and inductances in the supply wiring and equipment cause ringing or “echoes” of a power problem, further confusing the demarcation. Quality Power can be defined as Power without any of these defects. There are lies damn lies and statistics. However, several major studies have been carried out to record the types of disturbance and their frequency. George W Allen and Donald Segall of IBM System Development Division conducted one of the most respected studies and, although based in the USA in 1974, their report is still quoted today. They monitored AC power to IBM equipment at 200 locations in 25 cities across the United States, and recorded the various AC power anomalies that disrupted the equipment operation during a two-year time span. In other words their criterion for quality power was whether IBM equipment was disrupted. In 1974 most ICT equipment used linear power supplies which are largely unaffected by small transients and completely immune to most forms of noise. Today most ICT equipment uses switch mode power supplies whose susceptibility to transients and common mode noise is far greater. The Allen-Segall study concluded that 88.5% of AC power problems were transient related. Allen and Segall found that the most disruptive (49%) of power problems stemmed from oscillatory, decaying transients. These are examples of long duration, non-lightning related, transients. Lightning induced voltage spikes or impulse transients were the next most frequent, representing 39.5% of the total number of AC power problems. 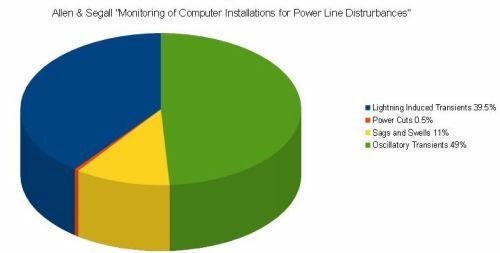 In contrast, power outages accounted for only 0.5% of equipment disruptions, whereas sags and swells were responsible for 11% of AC power problems. Electrical distribution systems have not changed significantly from the mid-seventies while electrical and electronic equipment has become much more sophisticated. Now, although power outages are becoming more infrequent, harmonic distortion has become a major concern for equipment users. Transient activity has also become increasingly more threatening to modern state of the art electrical and electronic load devices. M Goldstein and P Speranza “The Quality of US Commercial AC power” 1982, which records nearly double the frequency of disturbances at Bell Telephone sites. TS Key “Diagnosing Power Quality-related Computer Problems”, which leads to the development of the CBEMA curve detailing recommended immunities for a computer power supply. What are the symptoms of these Power Problems?